Nice Lite Oak throughout the interior of this Travel Trailer. Front bedroom with super storage underneath the lift-up bed. It also has a rare and convenient left side door. The center kitchen has it's own window over the sink. At the end of the counter is a nice bar for two with stools next to the door. The bathroom has a tub with skylight. The kitchen has stove, ovenmicrowave - two door refer. 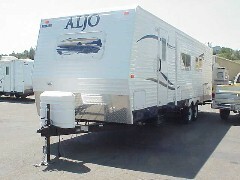 The outside is just as nice with awning, roof ladder; mounted spare tire with cover, 'clear-through storage storage too. 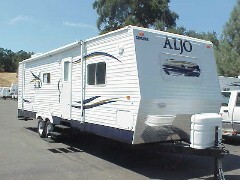 This is one great unit with great graphics and an equally great color scheme.